A few weeks ago my cousin came up from San Diego to spend the weekend with us. We managed to be decent human beings that weekend despite being a little drunk and calling his sister (who lives 3 hours ahead of us back in Michigan) late at night. A little background on this cousin. He is a Marine. And a ginger. That means he will cut your head off with cool sword because he has no soul. No I'm kidding. He is a cool guy. THM loves him. I love him. We shall call him THC. Treasure hunter's cousin. Now just because THC came up didn't mean I was not going to go to the flea market as planned. I dragged him along with me. He is cool so he didn't complain. The flea market was a bust. Everything so outrageously price. I tried to haggle with a center over 2 red Pyrex refrigerator dishes. He wanted $10. The lids were chipped bad. They were scratched and faded and just plain sad. He wouldn't go lover than $4 each, trying to tell me he could easily get $10 a piece for them. I looked at him and simply told him "you're crazy." and walked away empty handed. There was lots of Pyrex, saw 3 full primary sets of refrigerator dishes priced from $45 to $70. To much money for me. I didn't see anything I really wanted until I came across this little guy. 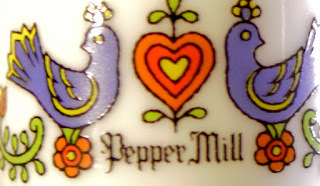 A Gemco "country life" pepper mill. I was taken by it. The milk glass in great condition. The blue birds are so cheery and it just screams to my heart. It was a bit dirty, but I washed it. It was on a small table mixed in with other glass. It was priced at $10. I still asked the woman, how much? She came back with $8. I countered with $5. I really didn't have a clue if that was a good price or a bad price, I just really liked it. She accepted and I went on my way with a little pepper mill. I'm so drawn to the blue birds. I don't know why but they make me smile. At another booth I came across the sugar bowl. In the same pattern. Having to do my inspection before asking about price I look it over. Then open it up. There was something inside. Something wrapped in newspaper. I pushed the newspaper around with my finger. It opens up. What do I see?...... A pipe. Like a illegal substance pipe. I sorta giggled. Did the woman know this was in her sugar bowl? I asked how much. She said $8. Now I would have countered with $5 but that stupid pipe. I noticed it had a little illegal stuff on it (the pipe not the sugar bowl) and for the price the woman gave me I figured she had no clue what was in it. I didn't really want to say take the Mary Jane pipe out and say I will give you $5. I didn't want to confront her. And I had my marine cousin and 3 year old with me. Not worth it to buy it. $5 sugar bowl was cool. But the Mary Jane pipe was not. Now don't get me wrong. I think Mary Jane should be legal. I think it could help with taxes. But on the other hand I really don't like our government system. I cannot win can I? The smart thing to do was leave the bowl and it's pipe. Keep THC (funny!) away from that . If you are wondering it wasn't a big deal to me. Hell I've smoked before, how do you think I could identify Mary Jane? I just want THC to have any thing going against him. I love him, he keeps us safe so I respect that I cannot be seen with a Mary Jane pipe mine or not in a public place with him around. My luck to a cop would of been standing behind me.